Viewed by many (including this writer) as the winners of the offseason, the Cubs' notable additions include Joe Maddon, Jon Lester, Jason Hammel, Miguel Montero, and Dexter Fowler. The only loss from the major league roster was Luis Valbuena. That move is mitigated by the presence of Kris Bryant. They made those additions without trading any of the ridiculous prospect depth that has accrued in the system. It's easy to get excited about this unit, but fantasy owners should bring a degree of skepticism. Young players tend to struggle in their first taste of the majors. Even Mike Trout scuffled when he debuted in 2011. Players like Bryant, Javier Baez, and Jorge Soler might need time to adjust. Temper expectations. If it all clicks, the Cubs could leap to the top of the NL Central this season. The Cubs have built a deep rotation, although roster considerations could force them to move Edwin Jackson or Travis Wood. The one-two punch of Lester and Arrieta could be among the best in the game. This certainly isn't the Nationals rotation, but it should offer solid production. After a dominant season split between Boston and Oakland, Lester is poised for the friendly transition to the National League. While the move is certainly a boon for his production, it is easy to get too excited about the switch. Last season was a banner season with a 2.46 ERA, 9.01 K/9, and 1.97 BB/9. Expect some small decline in production. The NFBC crowd views him as the 11th best starting pitcher. I see no reason to disagree. The Orioles have a bad reputation for micromanaging their pitchers. Among their rules, prospects may not throw cutters. Unfortunately, Arrieta's best pitch is a baby slider (a cutter/slider hybrid). His fastball runs 94 mph while the baby slider runs 90 mph. It would be closer to 92-93 mph if it was a true cutter or 87 mph as a slider. The Cubs told him to cut loose, and now he features a dynamic five pitch arsenal. Fantasy owners are wary of Arrieta, selecting him 26th among pitchers. He has the ability to outperform most of the pitchers ahead of him, including his teammate Lester. Frequent slider usage is linked to increased elbow injuries. However, it's unclear if the same observation extends to these baby sliders. Some view Hendricks as a sleeper candidate. He's a soft-tossing sinker baller without any true weapons. His changeup is a good pitch, but it won't translate to strikeouts. He'll provide solid value to the Cubs, but fantasy owners should look elsewhere. Hendricks is the 78th starting pitcher off the board. You can pick Jesse Hahn 79th, and he has a much higher ceiling. The final spot in the rotation likely comes down to Jackson or Wood. Tsuyoshi Wada is also on the periphery. These are all possibly spot starters off the waiver wire. Just look for the right matchup and stadium. Relief is a strength for the Cubs. Three inexpensive arms are capable of closing. Chicago turned to Rondon early in 2014, and the results were impressive. He locked down 29 saves with a 2.42 ERA, 8.95 K/9, and 2.13 BB/9. The strikeout rate is supported by whiff rates. His fastball and slider are especially impressive, although he also keeps hitters off balance by using a sinker and a cutter. If anything were to happen to Rondon, Strop and Ramirez are both capable replacements. Strop has pitched in parts of six seasons, but 2014 was the first time he trimmed his walk rate below 4.00 BB/9. His sinker and slider are both excellent pitches. So long as he limits the free passes, a low 2's ERA can be expected. Ramirez is similar to a right-handed Sean Doolittle. He uses the upper quadrant of the strike zone to produce high strikeout rates. In 43 innings, he posted a 1.44 ERA with 10.92 K/9 and 3.50 BB/9. With Wrigley Field's notorious winds, there are days when you'll want to avoid using Ramirez. This offense has the potential to be special. Bryant, Soler, Anthony Rizzo, and even Baez could be viewed as top 20 fantasy talents by this time next season. Baez is obviously the farthest from that ceiling, and Rizzo is already there. 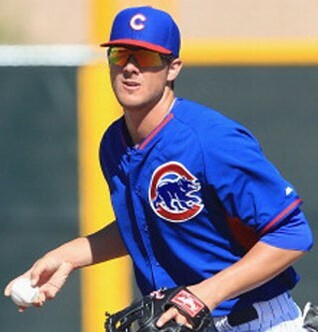 The supporting cast includes Fowler, Starlin Castro, Miguel Montero, Chris Coghlan, and Arismendy Alcantara. Top prospect Addison Russell is on the cusp too. Let's talk about the elephant in the room. As of this writing, Bryant has mashed eight spring home runs. Since he's not on the 40-man roster, the Cubs need only demote him for 10 games to earn an additional year of club control. It will be hard for Chicago to sell a demotion as anything but a shrewd business decision. The league likes to offer some on-field justification. The Cubs are saying he needs to work on his defense. The pretense is flimsy, but it doesn't have to be any better. The ZiPS projection system anticipates a .256/.339/.500 batting line from Bryant. Per ZiPS' creator Dan Szymborski, that's the best ever projection for a first year player. There is obvious ceiling beyond the projection, which includes only 29 home runs. Everyone agrees the strikeout rate will be high – probably over 30 percent. The hope is that he's a more dynamic version of Chris Carter with third base eligibility. The spring helium has him going around pick number 50 in recent drafts. Honestly, it's hard to advise you on how to proceed. We could be looking at a top 10 talent or a Carter clone (pick 112). Bear in mind, Carter wasn't nearly as good in the minors. The hype train continues with Soler. Expectations are high after he hit .292/.330/.573 with five home runs in 97 plate appearances. He has the raw skill set to supply 20 to 30 home runs, plenty of run production, and a solid batting average. He won't steal many bases. While I would love to own him, he's being picked with players like Mark Trumbo, J.D. Martinez, and Mookie Betts. I prefer the more established sluggers simply because they offer a safer path to similar production. Betts is a four to five category hitter with less power and a lot more speed. Baez was popular early in draft season, but sanity has begun to assert itself. He's one of those guys who oozes talent, but his contact skills require further refinement. He's struggled this spring and appears destined for a minor league assignment. While the 30 to 40 home run power can't be replicated elsewhere, you can find some five category guys like Rougned Odor and Chris Owings later in the draft. Looking for sneaky value? Coghlan is all but forgotten, but he could snag some early season reps near the top of the lineup. His skill set is forgettable, but you'd be counting on the guys after him to create value. He's currently the 102nd outfielder on the board. In other words, he's free. The Cubs are the 21st team in our power rankings. The upside is drool worthy with a dynamic offense and above average pitching staff within reach. The club's ceiling is based on the development of their trove of prospects. History has shown us that it's dangerous to depend upon too many untested rookies. The Cubs leadership has tried to alloy the youth with tempered veterans. The result could be a postseason berth in 2015. More likely, Chicago will be a force in 2016 and beyond. The offense has the potential to be among the best for fantasy production. Rather than investing heavily in the unproven components, it might make sense to grab value picks like Coghlan and Montero.